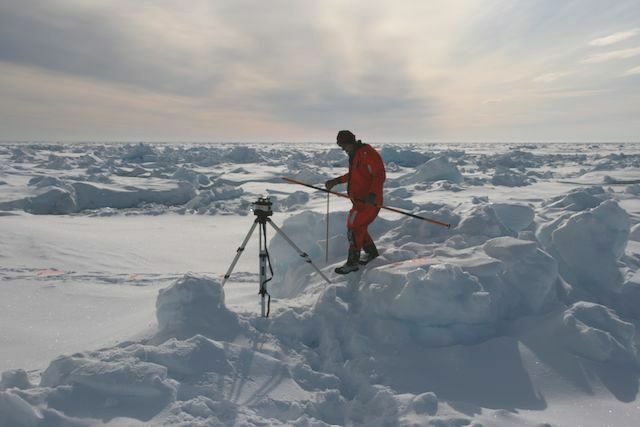 Over the last days we have been continuing with the work on the sea ice north of Svalbard, detailing snow elevation and thickness, taking ice-thickness measurements and sampling other physical properties of snow and ice. The weather had not been very favourable for long EM-Bird flights, but this changed last Wednesday and we managed to do three flights in one day, covering over 650 km at around at around 81°N 16° E.
We had a long 48-hour station on the sea ice where the various groups carried out their work. 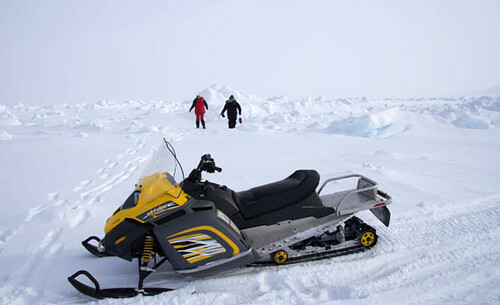 This included divers sampling flora and fauna the under ice, biologists doing incubations under the ice, oceanographers rigging up their turbulence instrumentations, and of course sea-ice physicists carrying on with their experiments. Again, transects were set up for snow elevation and thickness, ice thickness and of course flights over the lines with the EM-Bird. The ice floe was pretty big, so some additional long EM31 and snow-thickness lines were possible. 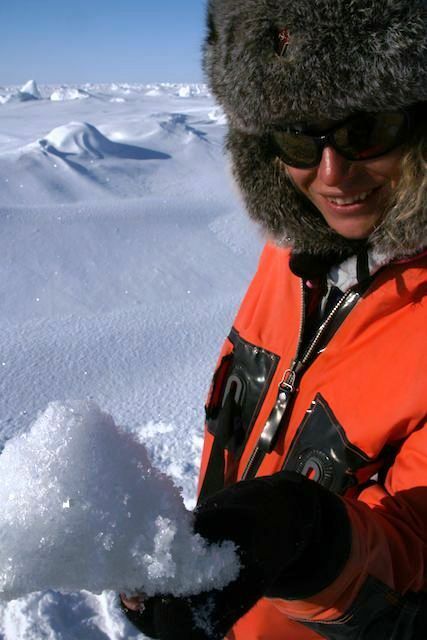 This time, snow pits and ice cores were drier than at the last station. On Thursday evening at 23.45 we took off with the EM-Bird again to fly along CryoSat’s track as the satellite orbited above. We also did a couple of parallel lines. After a rather tense 30 minutes with various restarts of the bird, computers and the software, things finally stabilised. In the end, we were in the air for 2.5 hours and managed to acquire data along more than 200 km of flight track. The lie-in the following morning was well deserved for heli-crew and EM-Bird operators! 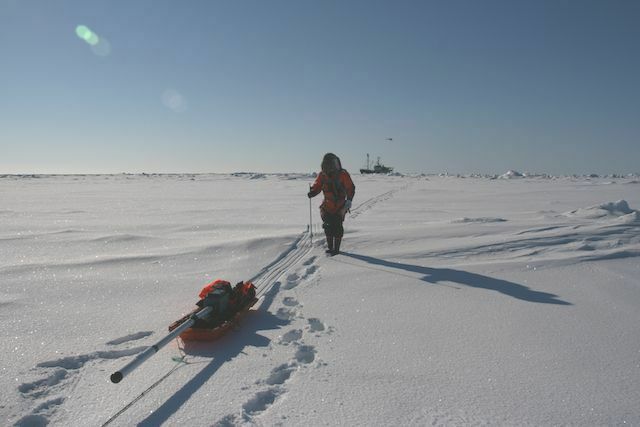 While they slept, the rest of the sea-ice team went out and measured the usual stuff on a floe that was perfectly aligned to CryoSat’s track of the night before. 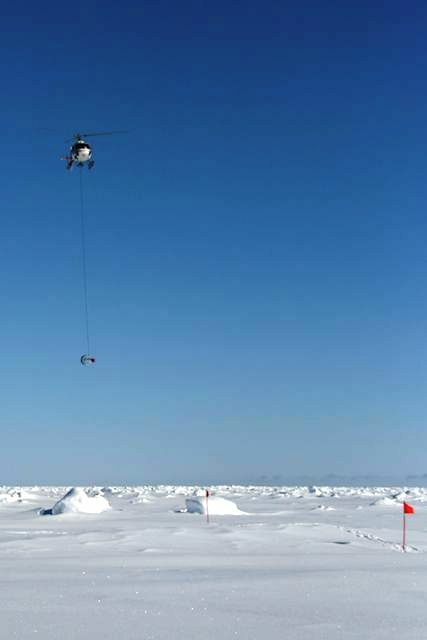 A short flight in the afternoon over the marked transects made the station complete and concluded the phase of the icebreaker’s cruise dedicated to CryoSat validation work. The cruise will now continue with more ice station work and an open ocean transect. We will continue to collect snow and ice data and fly whenever the weather permits. We’ve had a very successful 10 days, during which we managed to collect a comprehensive dataset that describes the state of the sea-ice cover north of Svalbard – at both small and large scales, from snow pits and point measurements to kilometres of ice-thickness measurements. This has only been possible thanks to the great support of the ship and helicopter crew who so often managed to get us to the right location at the right time – not an easy task in the ice covered Arctic!